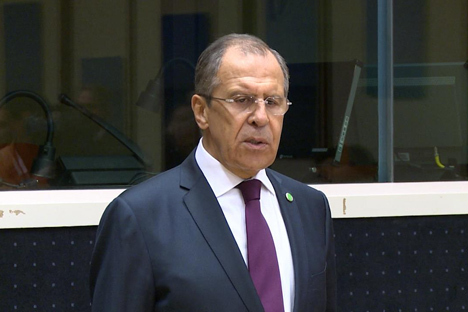 Normandy negotiators have underlined the absence of alternative to the agreements for Ukraine reached in Minsk on February 12, 2015, Russian Foreign Minister Sergei Lavrov said on Wednesday. "Today, and I emphasize this with full responsibility, all the four ministers firmly opposed such attempts [to resolve the Ukraine crisis by force]. My colleagues from France and Germany, in particular, stressed the absence of alternative to Minsk II," he said after negotiations held in Paris. In the words of the Russian minister, "There is an impression there are forces wishing to undermine this process. I'd not give the address, but such forces exist. Many, for various reasons, prefer a military scenario, the use of force, and many want the situation to escalate rather than calm down," Lavrov underscored. In the words of the minister, the Minsk agreements should be fulfilled "primarily in the field of ceasefire" and in matters "concerning the package nature of the Minsk agreement. Without making progress along the path of political reforms, it will hardly be possible to create an atmosphere necessary for the complete and good-faith fulfillment of the Minsk agreements," Lavrov said. Normandy negotiators also stated frequent violations of the ceasefire regime in Donbas and called for normalization of the situation in the field of security. "We have noted that, alongside the importance of progress [in the implementation of the Minsk agreements on Ukraine], special significance is being acquired by the task of stabilization of the military situation, the situation in the field of security. Unfortunately, violations of the ceasefire regime are growing frequent. There have been numerous violations in the area of the withdrawal of heavy armaments as well," Russian Foreign Minister Sergei Lavrov said at a press conference. Foreign ministers have called for boosting the activity of the Contact Group for Ukraine and working subgroups, Russian Foreign Minister Sergei Lavrov has said. "All the four ministers have adamantly called for stepping up efforts in the fulfillment of the Minsk II [agreements] and preventing the military scenario. We have supported giving a boost to the activity of the Contact Group and its working subgroups," he said. Ukrainian Foreign Minister Pavlo Klimkin has said that the meeting of foreign ministers in Paris demonstrated the unanimity of opinions on the need to adhere to the Minsk agreements. Klimkin said later that three subjects - ceasefire, prisoner exchange and elections consistent with the OSCE standards - remained crucial.